On 8 March 2015, the 2nd Sunday of Lent, the commemoration day of St Gregory Palamas the Archbishop of Thessalonica and the feast of the finding of the holy relics of the Blessed Matrona of Moscow, His Holiness Patriarch Kirill of Moscow and All Russia visited the Stavropegic Convent of the Protecting Veil of the Mother of God in Moscow. This year marks the 380th anniversary of the foundation of the convent and the 20th anniversary of its revival. Upon his arrival at the convent, His Holiness Patriarch Kirill venerated the holy relics of the blessed eldress Matrona at the Church of the Protecting Veil of the Mother of God and officiated at the Liturgy of St Basil the Great at the Church of the Resurrection. During the Liturgy, Archimandrite Ioann (Moshnegutsu) was consecrated Bishop of Soroca, vicar of the diocese of Chișinău (Orthodox Church of Moldova). 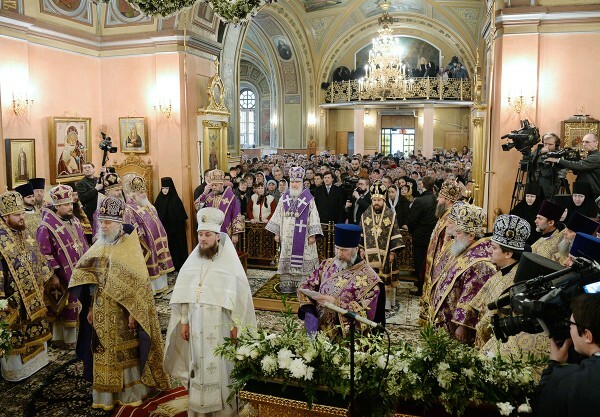 Concelebrating with His Holiness was an assembly of hierarchs and priests of the Russian Orthodox Church, including clerics of the Orthodox Church of Moldova. After the Litany of Fervent Supplication the Primate of the Russian Orthodox Church said a prayer for peace in Ukraine. His Holiness Patriarch Kirill also prayed for the repose of the soul of the recently demised Metropolitan Manuil of Karelia and Petrozavodsk. 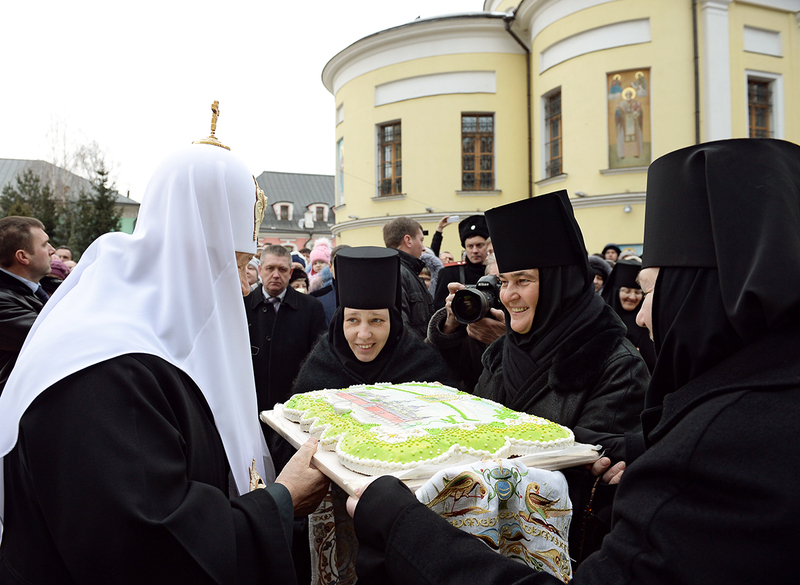 After the Liturgy Hegumenness Feofania (Miskina), abbess of the Stavropegic Convent of the Protecting Veil of the Mother of God, greeted His Holiness Patriarch Kirill and presented him with an old icon of the Protecting Veil of the Most Holy Theotokos. The Primate of the Russian Orthodox Church addressed the worshippers with a primatial homily. His Holiness presented the sisters of the convent with an embroidered image of the Last Supper. 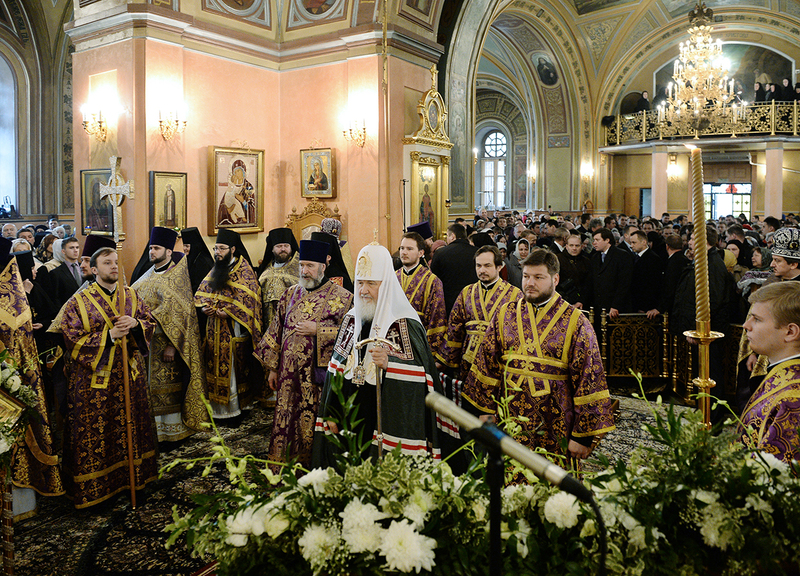 The Primate of the Russian Orthodox Church also presented high church awards and said a thanksgiving at the shrine with the relics of the blessed eldress Matrona.